Tops in Trucks winners say more with less as branding takes the spotlight. Perhaps it’s a sign of the times. Compared with the past, this year’s Tops in Trucks entries showed a lot less flash and a lot more restraint. Multi-color, graphic heavy wraps dominated entries in the early years of our contest, which started in 2007, aka, prerecession. But just as they’ve learned to do more with less in other areas, this year’s winning contractors have learned how to say more with simple fleet designs. This doesn’t mean the designs are any less effective or eye-catching, but clarity and straightforwardness are definitely “in” as contractors respond to customers’ deepened appreciation for honesty and trustworthiness. 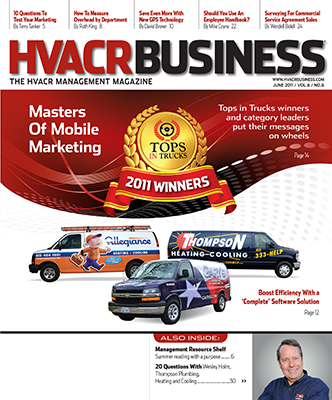 of three winning designs by New Jersey-based Graphic D-Signs, which also designed the fleet of Allegiance Heating & Cooling, a 2011 winner. The effectiveness of Graphic D-Signs fleet designs comes from a brand-based philosophy that considers the unique value that each contractor offers customers. Timo, for example, was looking for a retro logo design to match his company’s business model, and he immediately fell in love with the smiling “everyday serviceman” with a blue suit, black tie, and red toolbox. “People expect a higher level of service because of our brand — and we always lived up to that expectation — but now the logo image matches the reality,” Timo said. Timo’s faith in the power of branding is apparent in the scarcity of type and lack of secondary images in the fleet design. Other than the name of the company, type elements include a phone number, a website address, and the city and state — what would be considered the bare essentials. What Makes a Good Brand Design? and evoke specific emotions; listing facts about services and products, equipment, company owners, years in business, etc., is secondary. Indeed, with ever-growing instant access to these details via smart phones and other mobile devices, brand-focused fleet designs for local small businesses could be here to stay. If you can get a potential customer to feel good enough about your company to remember your name, they can easily find out more about you on their own. But branding guidelines are just that — guidelines. If your brand is about being an all-in-one service provider, for instance, then it makes sense to list services on your fleet design. That is why winner ServiceOne of Omaha, NE, lists its five services under the One Simple Solution moniker on the side of its vans. Wisely, these details pop against a simple green swoosh design and so don’t look busy or crowded. They stand out, and that was the whole point of the design, which was created by Revolutionary Wraps. “We consider all of these vehicles to be moving billboards,” owner Jeff Churchill said of the five (so far) wrapped vehicles in his 45-vehicle fleet. “As a result, we listed all of our main services in a clear, concise manner to attract customers’ attention. As another example, Apex Heating and Air Conditioning in Green Bay, WI, has a design that, among this year’s winners, comes closest to the loud, flashy wraps of this contest’s early years. Although the company’s four red, white and blue vans have a more subdued design, it’s still strong on “energy,” which was what Apex President Jason Braun wanted when he hired Chad Nelson of Victory Signs, who is known for his motorsports wrap designs. Braun said the most effective element of the design is that it turns heads but the information (company name, phone number, website address) is easy to read. 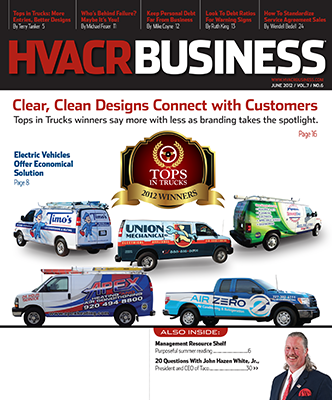 Winners Air Zero and Union Mechanical, both serving Florida, use images of their trucks on their websites, a smart way to maximize fleet-design dollars, but one that is only so effective at generating return-on-investment. Why not do more by combining a sharp fleet design and digital videos? Steve Moran, founder of website design and digital marketing services company AccelProfit Systems, said videos are the most common missing element of contractors’ digital marketing efforts. This is unfortunate because videos are an easy-to-create, low-cost, and high-impact method of brand promotion and marketing. Moran suggests making a video on the top five or 10 most frequently asked customer questions using one or more technicians or owners standing in front of a truck or van. Or make a customer testimonial video with a customer talking outside of his home/business while standing in front of your company’s vehicle. These videos can be put on a website, YouTube, or even emailed to customers or prospects. Not only will this provide another way to showcase your fleet investment, but it will also improve search-engine rankings. Moran said you don’t have to buy expensive cameras or invest in top-quality production. People have become accustomed to video recorded with a cell phone or inexpensive digital camera, and in fact, are used to and prefer the immediacy and natural tone of “homemade” videos. • A vehicle has four sides, so each angle should be given equal attention. • Depending upon your service hours and where you are located, vehicles could be out a lot when it is dark. If this is the case, choose designs with colors or wraps that glow or otherwise stand out in the dark. • Sometimes vehicles will be moving when people see them, and sometimes they will be parked. A design should be effective in both situations. • Vehicles get dirty. A dirty truck will ruin a great design. Make cleaning and polishing vehicles a regular routine, whether it’s part of a technician’s job or you hire a contractor. Finally, as roads become more congested and life speeds up faster and faster, encourage technicians not only to drive safely, but to be courteous and proud when they are on the road. Smiles will make your design even more effective, while scowls will detract from it.